Newbie question here: I'm getting back into hobby electronics and using Diptrace to draw some schematics. Drawing the schematic itself is no problem, but I'm wondering on how to properly draw/connect/annotate the power connectors and corresponding rails. I've attached a picture of the basic idea in DaveCAD. I want to hook up a power supply through a connector. The bottom rail is ground, the upper rail after the diode and elco will be used as +12V throughout the schematic. For instance for driving the IC's (drawn to the right). The second attachment shows the problem I'm encountering in Diptrace: how to draw this correctly? Do I draw a connector, wire that up and then use ground and +12V symbols to connect to the rails? I.e. does Diptrace know that if I connect these symbols in various parts in the schematic that those nets should be joined? I tried using the +12V throughout the diagram, but this did not translate in the ratsnest/ pcb design: all nets were still separate. So is there a special way to do this/ how do I do this properly without bodging up some schematic atrocity? Does anybody know a place where this is properly explained? 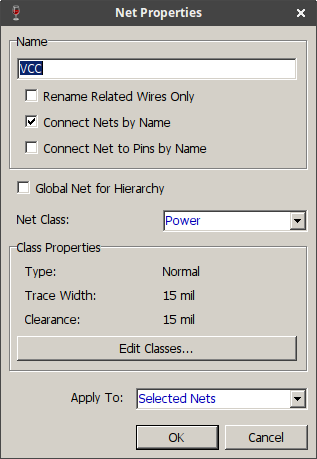 right click on properties on the net, select connect net by names. When you add another net with same name I think its automatic then. It has recently been updated. In your first sketch, you show +12V on the anode of the diode & again after the cathode of the diode. Clearly they cannot both be +12V. I would suggest affixing +12.6V (or +VCC) to the net associated with the anode of the diode & +12V to the net associated with the cathode of the diode. As you have discovered, DipTrace clearly highlights all the connections on the same net. A nice feature which makes it quick & easy to discover any design errors. Thanks for the reactions so far. I am currently working through the tutorial (should have mentioned that), but I'm already past the pcb design part. I didn't find how to do this in there. My DaveCAD sketch is indeed incorrect w.r.t. the 12V annotations, the idea was to attach 12V power to the right and then use the "12V" rail to the left to connect the other parts of the schematic to. every net/wire you add is a new ID#, unless 'connect net by names' is checked and you will be ok.